Week 9 was one of the best in the NFL this year simply because we were gifted a truly wonderful shootout between the Rams and Saints as well as a historic matchup between Aaron Rodgers and Tom Brady that didn't quite live up to the hype but was still entertaining football. Week 10 is … not great. Seahawks-Rams and Saints-Bengals are both solid matchups, but we did Rams-Saints last week (and were right on the side but wrong on the biggest total of the year). Patriots-Titans? Meh, and New England always wins in that series. Cowboys-Eagles on Sunday night? Dallas is a complete bore to watch (although I'd certainly take the Eagles -6.5 in that one). So, with not a lot to pick from and for maybe the first time in all my years at Doc's, I'm going to preview a matchup by choice where both teams are coming off their bye: Jacksonville at Indianapolis. Sure, last Monday night's Titans-Cowboys game was the same scenario, but I look at every Thursday and Monday game during the NFL seasons. You can take or leave the Jaguars as they are wildly inconsistent and tend to talk too much. Amazing what one season of success will do (here's looking at you, Jalen Ramsey). The Colts are interesting again because Andrew Luck is healthy and playing like a franchise quarterback. That's good for the NFL. Indianapolis looked dead in the water at 1-5, but if you looked closely at those results you should have realized this team was pretty good. It blew a fourth-quarter lead Week 1 vs. Cincinnati; could have won Week 3 in Philly (20-16); definitely could have Week 4 vs. Houston (37-34 in OT); OK, had really no shot Week 5 at New England (38-24); and blew another fourth-quarter lead Week 6 at the Jets. In Week 7, the Colts got well - like most teams will do this year - against the sorry Bills. Then, in Week 8 Indianapolis won a 42-28 shootout in Oakland. Not a great sign the Colts trailed a bad Raiders team, but a very good one they outscored the Raiders 21-0 in the fourth. Hey, any team (other than Buffalo) is tough to beat in its own stadium. Luck was great in that one in going 22-for-31 for 239 yards and three scores without a pick. But what's different of late is the emergence of Marlon Mack. Seems like Luck has never had much of a running game, but Mack has posted back-to-back games with 100 rushing yards and at least one score. No Colt had done that since Edgerrin James did it five straight in 2005. Indy also has a better defense this year led by rookie second-round linebacker Darius Leonard. He's No. 1 in the NFL in tackles. Are the Colts going to win the Super Bowl? Hell no, but the playoffs are doable despite being in last place in the AFC South and two behind the Texans in the loss column. Wouldn't you take Luck in any game vs. the Jaguars' Blake Bortles or Titans' Marcus Mariota? Indy's schedule is super easy with just one team left with a winning record: Houston. Five of Indy's remaining eight are at home: this one, Titans, Dolphins, Cowboys and Giants. Easily could win all those. The three on the road are Jags, Texans and Titans. None are unwinnable. As for the Jaguars, they are just broken. Leonard Fournette's early-season injuries have totally changed this offense. Jacksonville won last year with its punishing running game putting Bortles in short-yardage situations. This year, though, the Jags are averaging only 95.0 yards per game on the ground, and Bortles is back to turning the ball over all the time. Jacksonville had no cap room to deal for a QB by the trade deadline to push Bortles, but did sign former Steelers backup Landry Jones. More importantly, it's looking promising for Fournette to return from his hamstring injury on Sunday. The defense also has regressed in a big way, but I do think that's partly the offense's fault. The defenders are all trying to make hero plays because of Bortles' mistakes or the offense putting the D in terrible positions. At 5Dimes , Indianapolis is a 3-point favorite (+100) with a total of 47. On the moneyline, the Colts are -150 and Jaguars +130. On the alternate lines, Indy is -2.5 (-125) and -3.5 (+125). Jacksonville is 3-5 against the spread (1-2 on road) and 3-5 "over/under" (1-2 on road). Indianapolis is 4-4 ATS (1-2 at home) and 5-3 O/U (2-1 at home). 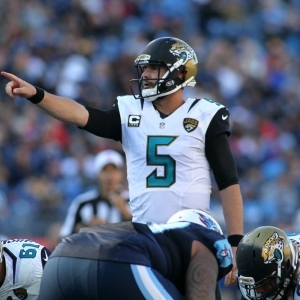 The Jags are 7-1 ATS in their past eight out of a bye. They are 1-5 ATS in their past six after a loss. The Colts are 8-3 ATS in their previous 11 after a bye. They are 2-7 ATS in their past nine vs. the AFC South. The under is 5-1 in Jacksonville's past six in the division. The under is 12-4 in the Colts' past 16 at home. The Jags have covered six straight in the series. The under is 7-0 in the previous seven at Indianapolis. Last year, the Jaguars swept the Colts easily, but that means nothing considering Luck missed the whole season. I'm going to hedge a bit here and make a recommendation on the assumption that Fournette plays (and doesn't limp off after a few snaps). Go Jaguars at +3.5 and under the total.